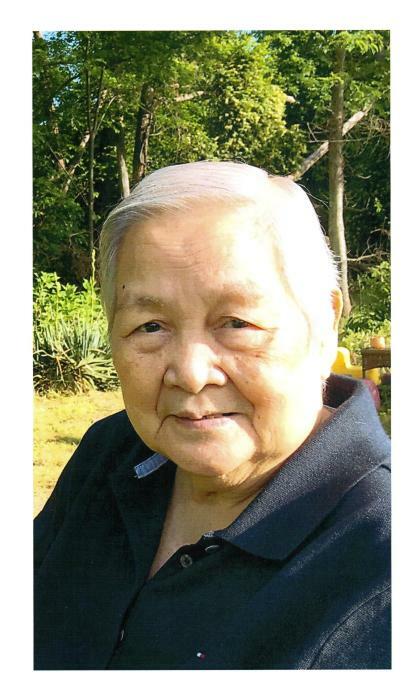 It is with a heavy heart that the family of Norma Celeridad Lema announces her passing on Saturday January 12, 2019 at the age of 83. Norma is native of the Philippines. She was the youngest of 5 siblings and was loved and admired by many. Norma is not only beautiful inside and out, but she is awe-inspiring. She loved to dance and taught ballroom dancing lessons, she enjoyed spending her time in her garden, but mostly enjoyed being surrounded by her loved ones having a good home cooked meal especially prepared by her children: Luvie, Baby, and Johnny-boy. Norma was a loving wife, and an amazing mother. Norma is an extraordinary grandmother who is adored by all of her grandchildren and great-grandchildren. She will be lovingly remembered by her husband of 65 years, Johnny Lema Sr. and their children: Luvimin Eubank and son-in-law Michael Eubank, Maribel Limasing and son-in-law Mario Limasing, and Johnny Lema Jr. and daughter-in-law Evelyn Lema. Norma is and will always be missed by her 9 grandchildren Michelle (Chelle) Eubank, John (Ricky) Eubank, Theresa (Tisha) Eubank, Norman (Gino) Lema, and Mathew (Bryce) Limasing, Jovel (Joy) Rice, Jennylyn (Jenjen) Robertson, Jonalyn (Jona) Lema, Johnny (Jev-Boy) Lema III,) Norma will also be missed by her great-grandchildren Dominic Mussoni, Gabriel Millford, Natalie Eubank- Logsdon, Myka Lema, Anaya Robertson, Jade Rice, Emma Rice, and our beloved predeceased Jaxon Rodgers.